Amongst my friends, family and coworkers, I’m known as the girl in the skirt. It’s so rare that I wear pants that it actually causes a commotion when I do. But, since I’m also a proud Canadian girl, it means I have a large collection of colourful tights to see me through ice storms and polar vortexes. It also means I have to be careful about the boots that I wear. Many of my boots don’t get worn nearly as much as they should, because the tops snag on my tights and cause runs. But not any more! 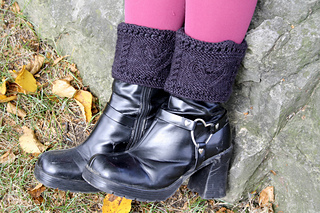 A simple pair of boot toppers has solved that problem! Adorned with simple eyelets, cabled hearts and couple of cabled columns, these toppers add an extra bit of style (and warmth) to your favourite pair of boots. And they knit up quick, so there’s no reason you can’t have them in every colour.